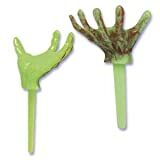 From now on, if cupcakes will be served at a Halloween party, then they absolutely must all have evil undead zombie hands breaking out through the top, reaching out for the brains of hungry guests. 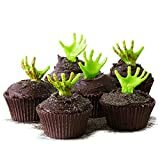 This cool new Graveyard Cupcake Kit lets you make 24 spooky zombie cupcakes complete with zombie hand picks / toppers, brown baking cups, and brown cupcake sugar to give them a soil-like appearance. 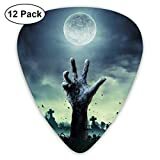 The zombie hands can also double as hilarious appetizer picks as well.